This Tamper-evident polyester laser material has a matte white look and has a white adhesive that if removed after application leaves a white VOID pattern indicating tampering has occurred. This material must be printed on desktop size color or black and white laser printers only. 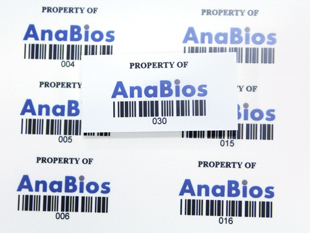 This material must be applied to metal, glass, or polycarbonate plastic surfaces and left to bond for at least 24 hours in order for the VOID to show when the label is partially or fully removed. The acrylic adhesive is adaptable to many surfaces with a minimum application temperature of 50°F and a service range of -40°F to 302°F. On rough surfaces or low energy surfaces, 102355 shows an excellent random tamper proof pattern. Will not work in large floor model lasers and copiers. This is a matte top-coated laser printable tamper evident matte white void polyester film. It is coated with a permanent, pressure sensitive acrylic adhesive and backed with a backside-printable, two sided, poly coated, tissue backed release liner. The tamper evident feature of this product becomes permanently nonfunctional after exposure to 104°F (40°C) temperature. This product is recognized for indoor/outdoor use with occasional exposure to lubricating oil and water. Note: For best bonding conditions, application surface should be at room temperature or higher. Low temperature surfaces, below 50°F can cause the adhesive to become so firm that it will not develop maximum contact with the substrate. Higher initial bonds can be achieved through increased rubdown pressure. In order to get a true measure of the adhesive's effectiveness, the label should be applied and allowed to bond a minimum of 24 hours prior to evaluation. Bleached 5.7 mil kraft paper (lay-flat) liner that has been poly coated two sides to give a controlled release. The above are typical technical values and are given in good faith based upon our most up to date knowledge and experience. As the products are used outside our control we cannot take responsibility for any damage that may be caused using the product. In every case, user shall determine before using any product in full-scale production, or in any way, whether such product is suitable for user's intended use for their particular purpose under their own operating conditions.